This sponsored post was written while participating in my partnership with National Dairy Council and One2One Network, but as always, all opinions are my own. My absolute favorite food in the world is ice cream. However, everytime I eat it, I get gassy much to my family’s dismay. I have often thought I was lactose intolerant, but when I look at scrumptious ice cream like butter pecan, I decide I am not. Who wants to give up ice cream? Not me! “But Jen”, you say, “Wouldn’t you know you were lactose intolerant from the other dairy products you consume?” You would think so because I am a HUGE dairy freak! My favorite foods are cheese, yogurt and ice cream. Not a day goes by where I don’t consume a dairy product. However, I eat yogurt with live and active cultures that break down the lactose before it bothers me. Even the cheeses I prefer like Cheddar, Colby, Monterey Jack, Mozzarella and Swiss are low in lactose. I’m not really a milk drinker, so my big downfall is ICE CREAM! So, I played around with the recipe my ice cream maker came with and I present to you…drum roll… Lactose Free Butter Pecan Ice Cream. Then just cause I wanted to be a little weirder, I made it with cottage cheese! Lactose intolerance is NOT a cow’s milk allergy. It is a food sensitivity. If you are lactose intolerant, your body doesn’t make enough lactase. Lactase is the enzyme which you need to break down lactose (the milk sugar). Symptoms like gas, bloating and diarrhea can mean you are a great candidate, but always consult your doctor for a diagnosis. Fun Fact! Did you know Lactose-free dairy milk has the same nutrients as regular milk? It tastes just the same. If you do think you are lactose intolerant or you know you are, you still need to get your dairy products in. Dairy products are sources of many nutrients our bodies need like calcium, protein, potassium, vitamins A and D. You can get a lot of information from the National Dairy Council at the NDC’s Lactose Intolerance Page. Do you know why I just so happen to have that handy reference available? 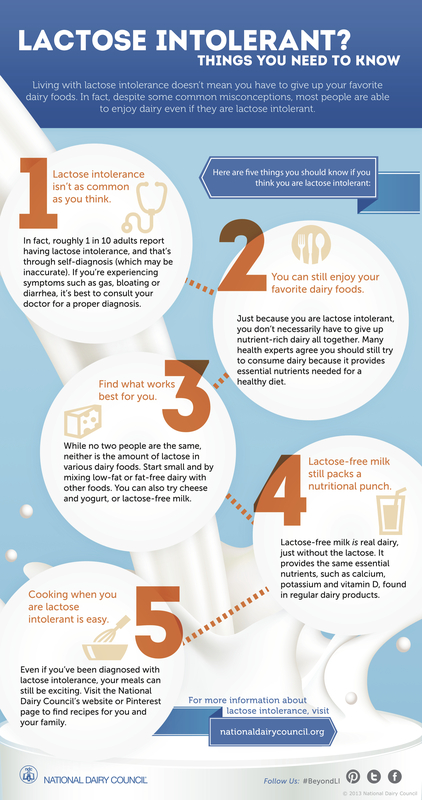 It is Lactose Intolerance Awareness Month, 28 Days of Eating Confidently, Living Fully and the ways that those with LI can incorporate dairy into their daily diet. You can find a ton of recipes for lactose intolerant diets like my Lactose Free Butter Pecan Ice Cream at the social media channels: NDC Facebook, Twitter, Pinterest and at the The Dairy Report (NDC Blog.